Orange Isle tops the first among the famous islands in Xiang River. It rides through the center of the river from north to south. Moreover, to its west and east end, there lies Yuelu Mountain and the Ancient City. After the Orange Isle scenic spot was first put into construction in March, 1960, it came to be open to the public finally on October 20th, 1962. Then on June 10th, 2007, its name changed into Orange Isle Park Administration in Changsha. Thereafter，it renamed again into Office of Orange Isle Scenic Spot in Scenic showplace of Mt Yuelu in Changsha after it was officially listed the national AAAA landscape scenic spot region in 2001. As to the reputations of the Orange Isle, it ranks the national civilized tourism demonstration site, one of the first group of national classical “red tour” scenic spots, Provincial civilized Unit, Unit of a hundred scenic spots in Hunan and one of the eight beauties in Xiaoxiang. Besides, it is the core element in Changsha’s tour pattern that surrounds mountain/water/islet and city. The original area of the tour region is about 17 acres, of which 6 acres is open to the public. 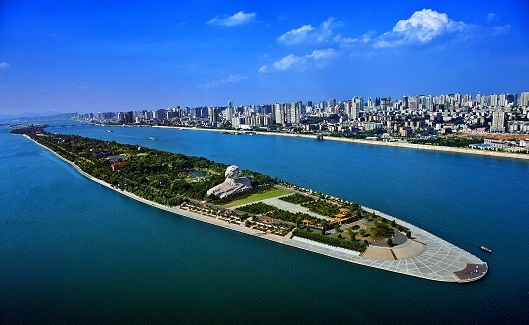 The primary scenic spots include Orange Pavilion on the Isle, the stele with Poetry made in white marble, Bronze Statue Square, Pergola Square and the Site in memory of Chairman Mao when he visited Xiang River. With a total land area of about 91.64 acres and a large number of investment funds that equaled 1.4 billion, the annual capacity of tourists can reasonably be estimated to reach 2.0946 million persons. As for the development and the construction of the whole scenic spots, it can be generalized as an axle with four regions. The axle here means the tour path that connects the north and south end. The four regions now refer to the core Scenic Spot, the tourism supporting service region, the beach park and the sports area for water activities. The construction of the new scenic spot closely catches the theme of “ecology, culture, tourism and leisure”, during which the building could be fully utilized and perfectly conserved. Besides, in order to show its historical and cultural unique feature and create a dense atmosphere of “Red Tour”, the statue of Chairman Mao is regarded as the primary scene. 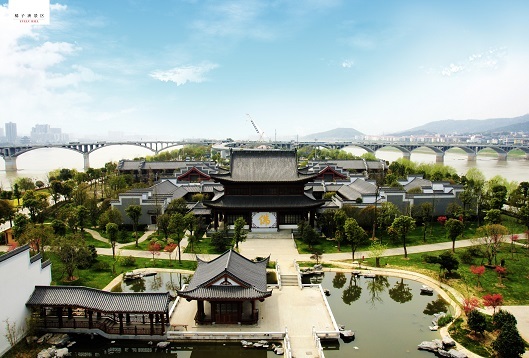 The main scenic spots in the new tour region include: Wentian Platform, the islet park, Chairman Mao’s Artistic Statue at his youth, the orange orchard in a hundred acres, the culture garden and Orange Isle hotel. In April 21st, 2009, under the approval of the municipal Party committee and the government of Changsha, Orange Isle Scenic Spot started to freely open to the tourists. Four regions were divided in the construction of Orange Isle: Orange Isle Core Scenic Spot, the Beach Park, the Tourism Supportive service Region and the sports area for water activities. Among those, Orange Isle Core Scenic Spot is the most important part.